4/4/2007Share this story on Facebook! With what could only be described as painful optimism, sophomore Fallon Blossom narrates how she lost her home as she leads her fellow Ithaca College students through the gutted remains of the house she grew up in. Across the street, a mud-encrusted American flag flutters gently in the wind. Behind it, the house it used to belong to has been shredded and mangled, two-by-fours protruding from its walls like the ribs of a corpse. The insides are gutted, rotted, and awaiting demolition. Further into the home, smothered in a stew of sludge, mud, and household items, a child’s plastic Nerf gun and picnic table lay forgotten. This is the new Lower Ninth Ward, once a thriving New Orleans neighborhood. 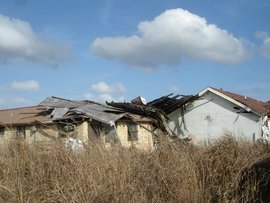 It is a place abandoned by its people, its city, and its past since it was decimated in the flooding caused by Hurricane Katrina. It’s now not much more than a barren floodplain, with houses tossed across washed out streets and yards, their insides gutted, waterlogged, or both. What’s really striking about the devastated neighborhood aren’t the mangled houses that have been tossed around like toys, the broken stop signs and telephone poles snapped like twigs, or the dry grasses that have overgrown the Louisiana neighborhood: it’s the absolute silence. In a place where children used to play games, mothers cooked delicious meals of jambalaya and red beans, and communities came together for parades, parties, and live music, only broken and twisted ruins remain. As we walk by an empty lot, Fallon tells us that there used to be a community store there. “That was a chill place,” she recalls. I lag behind as the rest of the students follow her. I cannot believe my eyes. Suddenly, a white tour bus zooms down a deserted side street, blowing dust up from the road and filling the neighborhood with the noise of its engine. The faces of the people inside are fixed to the windows, and their mouths are slightly agape. They barely notice me, standing alone in a driveway missing its house. Then I’m alone again, watching as the other students take pictures of the rebuilt levee that is keeping the neighborhood more or less dry. Too bad it didn’t work when the people who used to live here needed it most. When we leave, none of us speak. The radio is off, and all we’re left with is our thoughts as we rise out of the Lower Ninth on Highway 10, climbing out of the forgotten city in our vans as the Superdome looms on the horizon. We zip through the Sixth Ward, where outside, a spontaneous parade has formed to celebrate the New Orleans Saints recent victory. Residents are walking down the street with instruments, shouting, cheering, singing, and dancing. It would be a happy sight, if we hadn’t just left a neighborhood where a parade like that is only a memory, where singing and dancing has been replaced by silence.